The Centre - Livingston at LivingstonAlive.co.uk. 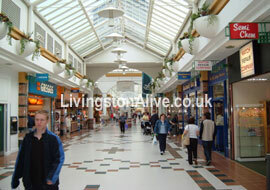 Shopping in Livingston, West Lothian with Almondvale and McArthur Glen. Note: New photographs of The Centre will follow shortly. 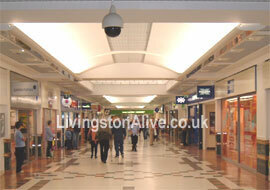 The Centre is a large enclosed, shopping centre, in the heart of Livingston’s town centre. As one of Scotland’s five new towns, Livingston was created in 1963. The first phase of The Centre was built in 1976 to facilitate the needs of this local population. 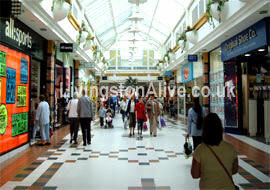 The shopping centre was refurbished in 1988 by Land Securities, and was extended by 230,000 sq. ft in 1996, creating phase 2 of the development, which brought the size of the mall to 550,000 sq ft. In 1999, substantial investment was made to revitalise the Centre through refurbishment, giving it an increasingly modern appearance. The new development is also home to Livingston's winter garden - which offers comfortable seating and catering in a leafy garden environment providing an ideal break from the busy shopping areas. Built as a new town, Livingston does not have a traditional High Street and so in effect, The Centre is the town's high street shopping district and this was reinforced with the Elements Square development, which was built with the modern day shopper in mind and features double height glass shop fronts, terracotta and zinc walls and granite flooring - materials traditionally used in outdoor developments - to help give the feeling of shopping on the high street indoors, enabling customers to meet, relax and eat, whatever the weather. To further enhance the outdoor/indoor feel, the roof has been specially designed using ETFE (plastic ‘air-cushions’ as used in The Eden Project), to ensure daylight floods into the mall. In the evening, lights are also embedded in the roof to give the impression of shopping under starlight. Nowadays, the Centre is a contemporary-styled, modern shopping complex, accommodating over 155 units. It has attracted many high street names including Debenhams, Marks & Spencer, Asda Wal-Mart, WH Smith, Mothercare, Woolworths, Argos, Next, HMV, JJB, Boots, M&Co. River Island, H&M, Waterstones and many more...plus 4 new restaurants have also now opened in The Avenue, just adjacent to The centre with top names including Wagamamas, ASK, Nandos and Chiquito. The centre really does have a superb range of top name shops and stores offering exceptional choice and convenience. Plus there are thousands of fr ee car parking spaces, a shoppers’ crèche, shopmobility service and a variety of cafes, bars and restaurants. Its 155-strong combination of family favourites includes Argos, Bhs, Boots, GAME, HMV, Mothercare, Next, River Island,WH Smiths, Woolworths, Republic, Barclay Diamonds, AB10 and Swarovski as well as a range of smaller specialist units including Kirkton property Centre. Plus, its location beside Scotland’s largest Asda Walmart, the Livingston Designer Outlet and 3 major retail parks means that you will have the opportunity to visit over 235 different shops and stores whilst you are in Livingston town centre. Lothian Shopmobility is also available onsite where shoppers can hire both electric scooters and manual wheelchairs free of charge. The Centre is open 7 days a week, with late night trading on Thursday evenings, offering you the flexibility to shop whenever it suits you.